If you have just moved house and discovered that your heating is controlled by our smart thermostat Cosy, then look no further for a quick guide to get your up and running! First we would like to say congratulations on moving house! 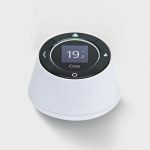 As you are reading this article we will presume that you have moved in with Cosy and that your home has our Cosy smart thermostat installed. Without these 3 items in place your system will not be able to work. If you are missing any of these pieces or are not sure if they are working, then please call our support team on 01223 850 218. Hopefully you will have established that your kit is complete or will have any missing items on their way to you. Now you will need to install the Cosy app, this is how you set the heating schedules that will automatically turn your heating on and off. The Cosy app is available on both Android and iOS and can be installed on both mobile and tablet devices. Once you have the app installed it will launch on a log-in screen, here you can create a new account by selecting “join now”. Once your account has been created the app will guide you through how to set-up your Cosy smart thermostat. In order to get the Cosy smart thermostat up and running you need to check that you have the 3 main components in place and set-up correctly, these are the Display, the Hub and the Switch.